This second team of X-Treme X-Men are also the newest form of The Exiles. The team members are – Dazzler, Kurt Waggoner, General James Howlett (who is dating his universe’s Hercules – which is pretty cool), Charles Xavier (with his head in a globe) and Sage – I believe she is our Sage, a hold over from the Exiles team. This is a .1 issue, which was meant to be perfect jumping on points for new readers. This is the only issue I own of this second volume. The main mission of the X-Treme X-Men are to kill ten evil Xaviers. I thought this was the Dazzler of our universe. Issue opens inside Sage’s robot space ship. Dazzler explains how evil Xaviers are going to destroy the multiverse. Howlett was the former Governor-General of the Dominion of Canada. Kurt is fourteen. I like comics with these character caption boxes, perfect for the .1 program. Dazzler asks Sage for help finding their Futurama Xavier. Seventeen Minutes Later. Sage was able to locate the nearest Xavier, so the mission begins. They see a few Brood and with an amazing page turn reveal, we see a giant Acanti with Xavier’s face! So crazy! He is being controlled by a pimp Brood Queen, who wants to go to a defenseless dimension. It is defenseless due to it not having a Xavier. We see Cyclops, waking up in a tent off the shore of Utopia, the former home of the X-Men. I’m not sure if this is suppose to be the Proper Marvel Universe. I suspect that it isn’t, as his powers are broken but he is living on his own and eating trash. Scott sees an Xavier but turns out, he is a Brood induced nightmare. Dazzler kills the few Brood that was holding Cyclops. Later. Dazzler confirms it is not her Cyclops. This Earth was practically ruined by the Avengers versus X-Men battle. 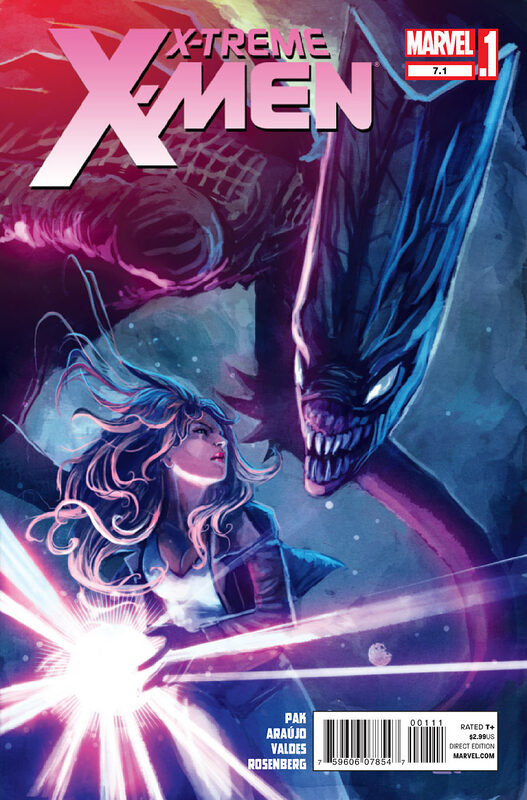 Here, the same X-Men were given parts of the Phoenix Force, including Magik. Hence, why I bought this issue. 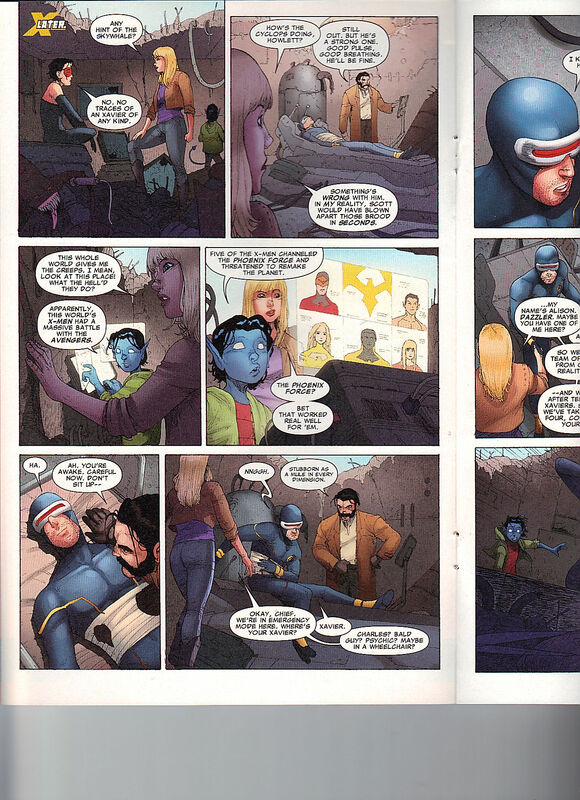 Howlett says that Cyclops are stubborn in every dimension. This Cyclops did kill his Xavier. Dazzler and Kurt recount the evil Xaviers – Cowboy Xavier, Steampunk Godworld Xavier, Cthulu Floating Brian Xavier and this Cyclops’ Xavier – four dead, six to go. The Acanti Xavier appears on Earth. The Brood Queen instructs her minions to feed on the planet. The X-Treme X-Men start killing the Brood. A Brood grabs Johnny Ito, Dazzler’s lover. Cyclops wants to kill whale Xavier, but Dazzler is concern with all of the deaths once he lands on the ground. Howlett saves Johnny Ito. Howlett gets to cut loose on the Brood, it gets pretty bloody. Acanti Xavier lands on the ground, Howlett kills the Brood Queen. Sage thinks it is too easy but Xavier reveals that he was resisting the Queen’s influence. Xavier tells Dazzler to kill him, there is too much as risk if two Xaviers unite. She does it. Later, Cyclops is mad at Dazzler, as there were other options, there was no need to rush to the decision to kill Xavier. Issue ends with him giving her some advice on leadership. With this issue, I complete all of my reviews of the comics my Mother-In-Law was nice enough to give me a Mile High Comics’ gift card so I can buy them. Been a pretty fun bunch of comics and only one of them, I didn’t need for the collection.